Check out some of what Roti will be offering when they open today after the jump. Let’s start with breakfast. You can choose from a trio of sandwiches for $3.50 each. What’ll it be? The Conquistador, with chicken, eggs, avocado, feta and spicy sauce? The vegetarian Shauk-Shouka? Or a Steak Roti with peppers, onions and feta? Or maybe you’ll forgo the sandwiches altogether and opt for a bowl of hot oatmeal with up to three toppings (also $3.50). Of course Roti’s breakfast options are just an opening act for the main event: lunch. Picture rotating skewers of sliced steak and chicken, the unmistakable aroma of sizzling meat making you hungry while you wait in line to place your order. Whichever you choose, a portion is expertly sliced off and served one of three ways: in a sandwich (pita or laffa again), on a plate with Roti rice and three toppings, or atop a salad of mixed greens and your choice of toppings. 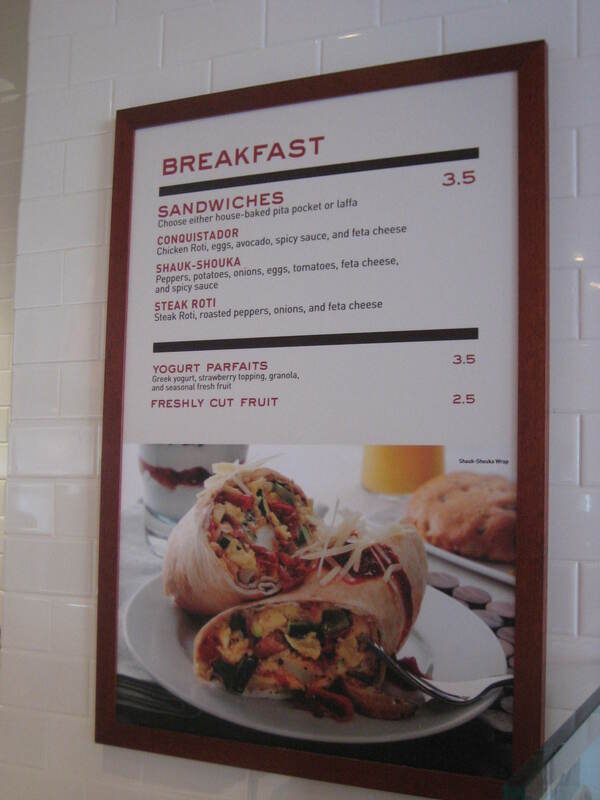 The sandwiches are $6.75 each and the salads and plates run $7.75. Trying to be a little bit healthier in your dining choices? Then you’ll want to skip the roti (the rotating meats) and turn to the kabobs, instead. 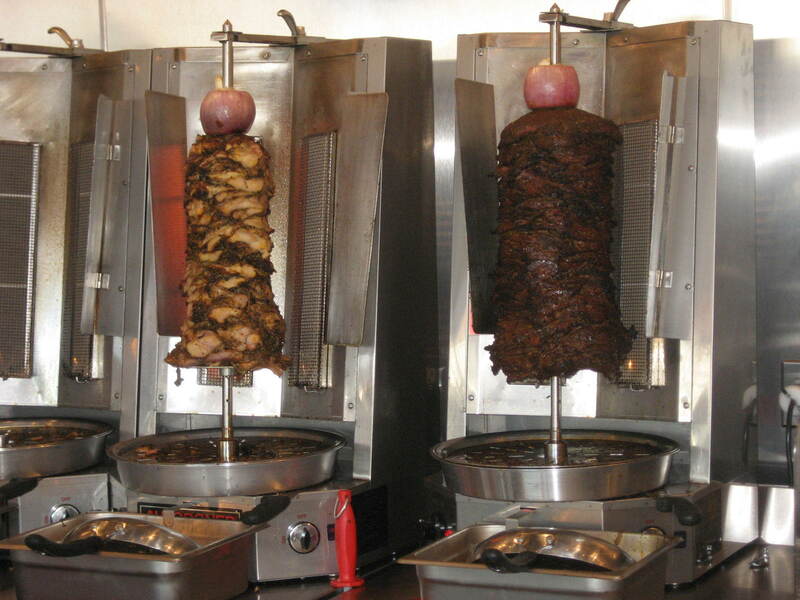 The chicken kabob is made with skewers of chicken breast and the steak kabob is grilled sirloin. Both are lower-fat options than their sliced counterparts. You can also opt for falafel as your protein of choice, or go the vegetarian route with roasted vegetables. In all cases, your next challenge is to find that perfect combination of toppings and sauces to bring everything together without overwhelming the bread. 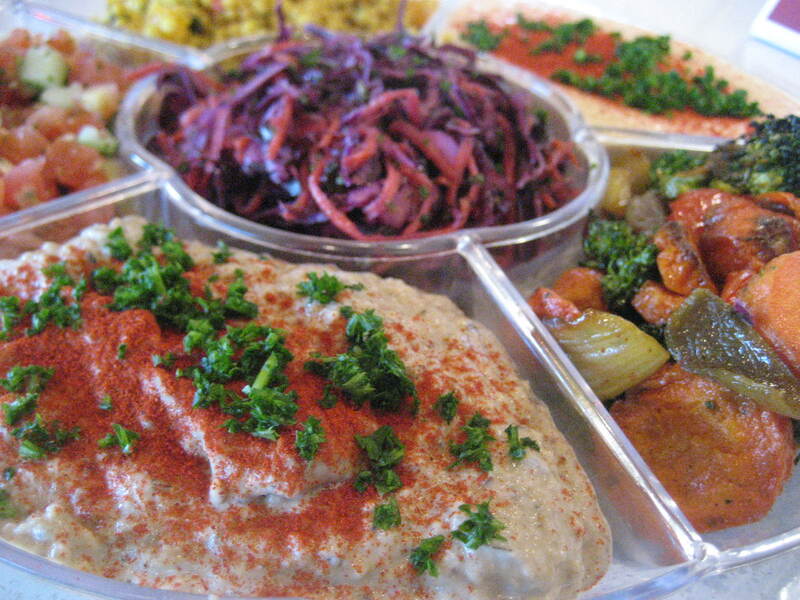 Choices include hummus, cous-cous, feta cheese, kalamata olives and baba ghannoush. If you’re feeling adventurous, check out the zhug, a fiery red sauce derived from hot red peppers. 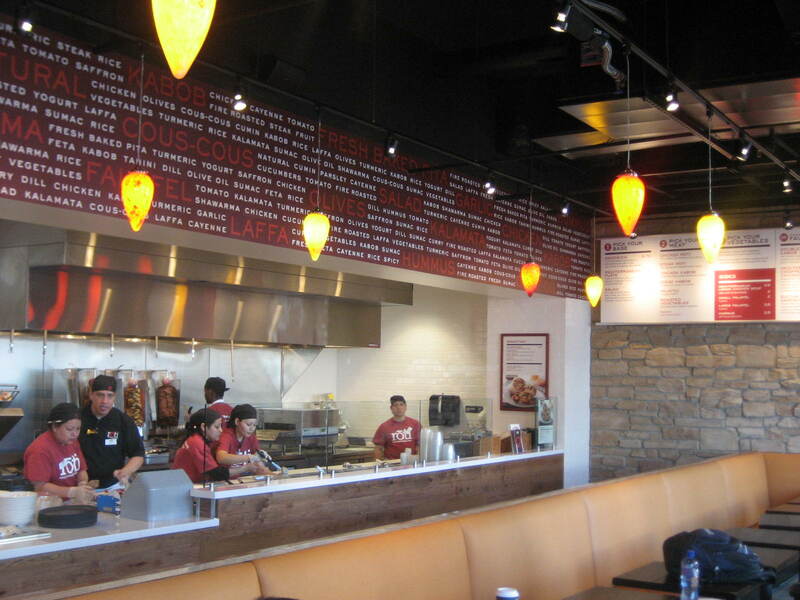 This store represents the second location in Washington for corporate-owned Roti, which is based in Chicago. They’ve got an aggressive expansion on tap, with plans for as many as three more local outposts by the summer. 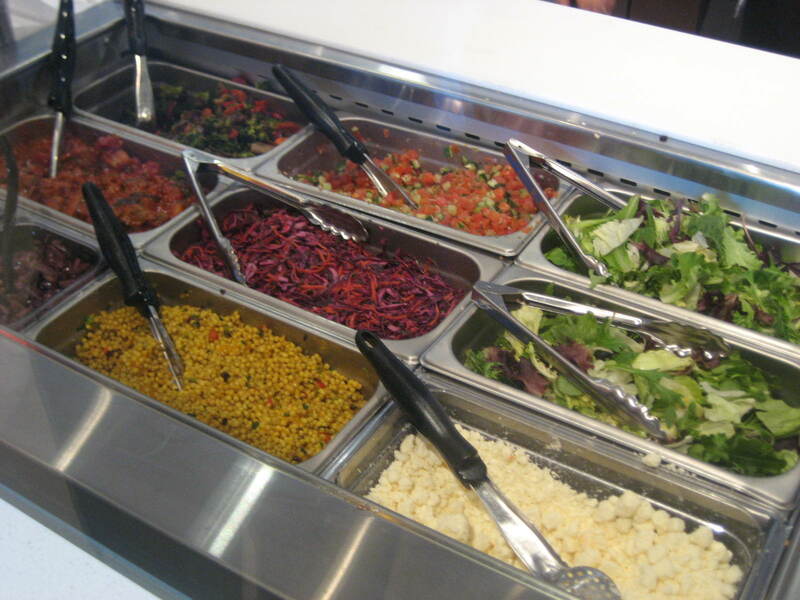 And they supplement their in-store sales with a robust catering option that includes wraps, salads and platters for groups of all sizes. Although we haven’t had a chance to sample the flavors yet, Roti sounds like a great low-key meal option that I’m looking forward to checking out once the crowds have died down. 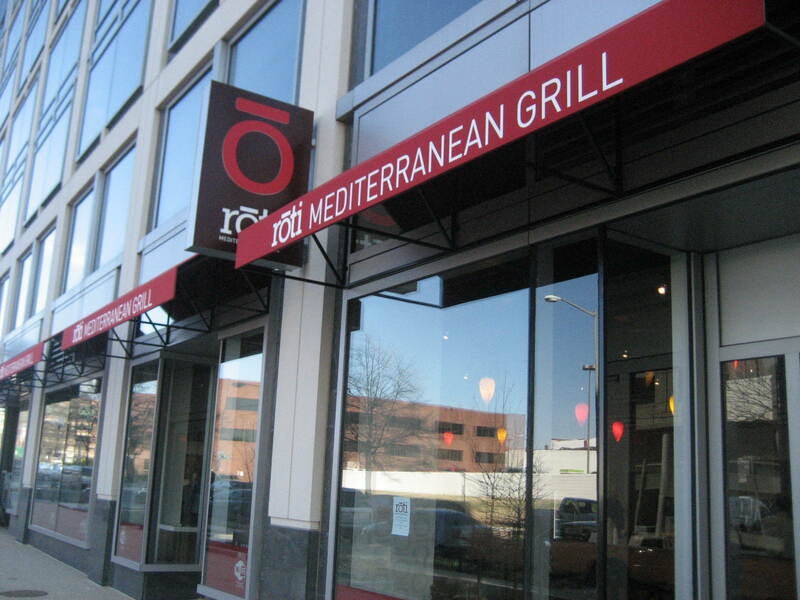 I work right down the street from the Roti on Penn Ave and it has become quite the favorite amongst all who have been. I live right around the corner from this second location and think it’s absolutely awesome they’ll be open on Saturdays!